A manuscript in the process of being copyedited, with "Track Changes" and "Show All Markup" on. Copyediting can take a few days or a few weeks, depending on the editor's workload. It is rarely longer, though "heavy" editing and structural editing, rather than straight copyediting, can take up to two months. When the manuscript comes back from the editor, the Editorial Manager will add it to the Production page and notify you. It is not a "designed" document, and will have been formatted by the copyeditor to make it easy for the designer to work with; if you have any layout requests for the designer please enter them in the Author Stylesheet section of your book's Production page. Print the manuscript out if you wish. It should be pretty much word-perfect, hopefully, apart from queries raised by the editor (they usually come as a separate note). Hard copy: You won’t get a hard copy of the copyedited manuscript. Do not send corrections by post. Click on the double arrows in the "Copyediting" stage in the Production workflow, and open the document. You can either work on it on screen, or save it to your computer and work on it from the saved location. "Track Changes": We do request our copyeditors to edit the manuscript with the "Track Changes" facility switched on. This means the text will come to you with all changes marked. The tracked-changes markers are for your benefit, so you can see what has been altered. If they are of no benefit to you, by all means turn it off. You don't have to accept all the changes made by the copyeditor, but it's recommended that you do. How to switch on "Track Changes": In the most recent versions of Microsoft Word, in the Review tab, in the Tracking section, choose "Track Changes". When you turn on "Track Changes", Word marks up and shows any changes that anyone makes to the document. On the Review tab, in the Tracking group, in the Simple Markup list, choose a view option. "Simple Markup" is the default option, and indicates where changes are with a red line in the margin. The line at the margin to show a tracked change is at that location. "All Markup" shows all edits with different colors of text and strikethrough. In the "Show Markup" list, choose the revisions you'd like to see – Comments, Ink, Insertions and Deletions, Formatting, Balloons, Specific People. If you would like more information on "Track Changes", or are using an older version of Word, follow this link for Microsoft's guide to "Track Changes". The markup facility can be turned off from the “Review” option on the Word Menu. Just click the “Track Changes” button on the menu bar and it toggles the markup off and on (Press F1 for help from Microsoft to explain in more detail). If apostrophes and quotation marks are duplicated, it’s just a question of setting “Final Show Markup” to “Final” in the Tracking Group on the Review tab. For Word 2013: When you open a document with track changes done in an earlier Word version, even if the editor has left it with “Track Changes” showing, it reverts back to default of “Simple Markup” and they don't show. You have to change this to “All Markup” in the top drop-down box (this is “Final: Show Mark-up” in earlier versions of Word) if you want to view changes. Returning the manuscript: When you return the edited manuscript, rename it with the new date, e.g. 21.09.2014 (English date-sequence please). Re-upload it to the Production page under "Final Copyedit," and click on the "Approve" button to notify the editor. If you have not already done so, all changes will be accepted and the correction facility turned off. (Leaving it on, or leaving changes "Unaccepted" affects the flow of the document into the design software at the next stage.) Add any comments to the workflow box. Endorsements; Think about these. There is space on the back cover for two or three brief ones, or extracts (see Cover below). We provide the text for the back cover—put any requests for particular endorsements to be used in the “Cover” workflow stage on the Production page. The full versions, along with others, add them to the front of the manuscript and we will feature them in the opening pages. They need to be fairly serious endorsements, rather than random individual recommendations. One or two endorsements only on the page can look a little odd, more than a dozen is too many. Do delay sending the manuscript back if you are waiting for some to come. If you have important endorsements come in after you upload the final manuscript, we can add them to the back cover but not the inside of the book. For more information see the section on Endorsements in Chapter 4. Check words that someone unfamiliar with the subject (like the copyeditor) may not be aware of, like proper names and specialist subject information. 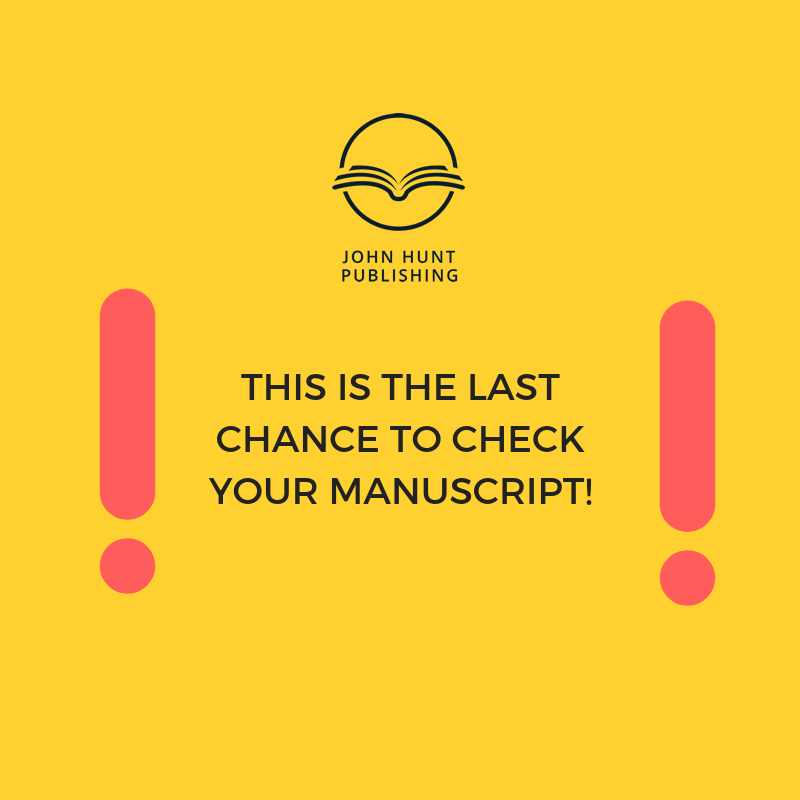 This is your last chance to change the manuscript. If you wish to make further changes, through the Author Forum, Editorial & Production section, there will be a minimum £100/$170 charge (see Printing for more details). We then send it to the designer who creates the proofs, and the proofs are sent to in-house editors for proofreading. They check for design errors/typos etc. but carry out no textual rewriting or enhancement. Also, please be aware that there is no author involvement at the proof stage. If you upload amended proofs the designer will ignore them as he is commissioned solely to work on proofs sent in by our editors. In rare cases we use a PDF supplied by the author – for instance if the book has already been published digitally and we are taking it on, and the quality is already fine. In this case we do not copyedit, the designer works directly with the author giving them the technical spec and adds prelims. We cannot "get into" a PDF that we have not generated ourselves.